Abstract: Does information irrelevant to government performance affect voting behavior? If so, how does this help us understand the mechanisms underlying voters’ retrospective assessments of candidates’ performance in office? To precisely test for the effects of irrel- evant information, we explore the electoral impact of local college football games just before an election, irrelevant events that government has nothing to do with and for which no government response would be expected. 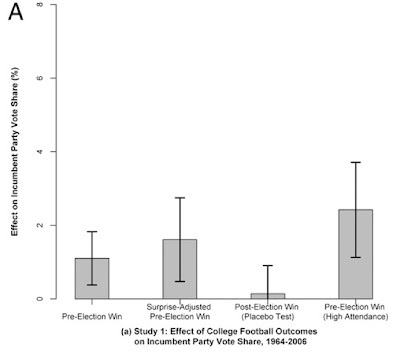 We find that a win in the 10 d before Election Day causes the incumbent to receive an additional 1.61 percentage points of the vote in Senate, gubernatorial, and presidential elections, with the effect being larger for teams with stronger fan support. In addition to conducting placebo tests based on postelection games, we demonstrate these effects by using the betting market’s estimate of a team’s probability of winning the game before it occurs to isolate the surprise component of game outcomes. We corroborate these aggregate-level results with a survey that we conducted during the 2009 NCAA men’s college basketball tournament, where we find that surprising wins and losses affect presidential approval. An experiment embedded within the survey also indicates that personal well-being may influence voting decisions on a subconscious level. We find that making people more aware of the reasons for their current state of mind reduces the effect that irrelevant events have on their opinions. These findings underscore the subtle power of irrelevant events in shaping important real-world decisions and suggest ways in which decision making can be improved. Reminds me of this one on beliefs regarding global warming, and this one on whether to go to college.